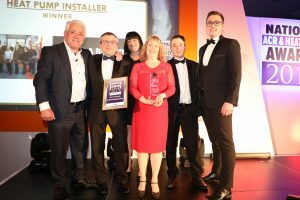 R A Brown Heating Services were pleased to win Heat Pump Installer of the Year at the National ACR & Heat Pump Awards in Manchester last week. The judges selected R A Brown as winners, having completed 52 individual heat pump installations over the past year, with a combination of both ground and air source heat pumps, which has seen a 73% increase on the previous year. The picture shows, Richard and Louise, along with engineers Alan & Toby collecting the award.